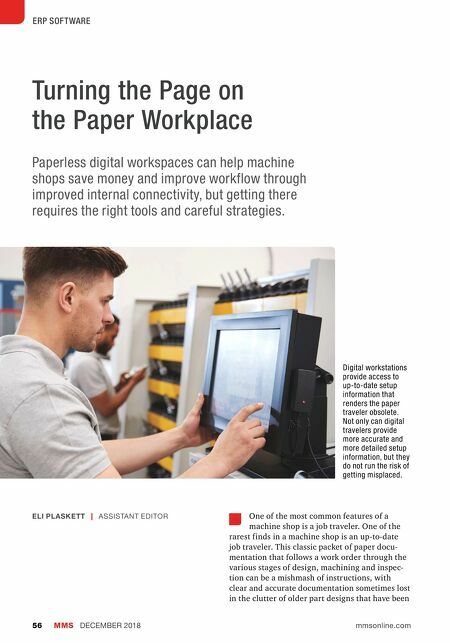 MMS DECEMBER 2018 56 mmsonline.com ERP SOFTWARE Turning the Page on the Paper Workplace Paperless digital workspaces can help machine shops save money and improve workflow through improved internal connectivity, but getting there requires the right tools and careful strategies. 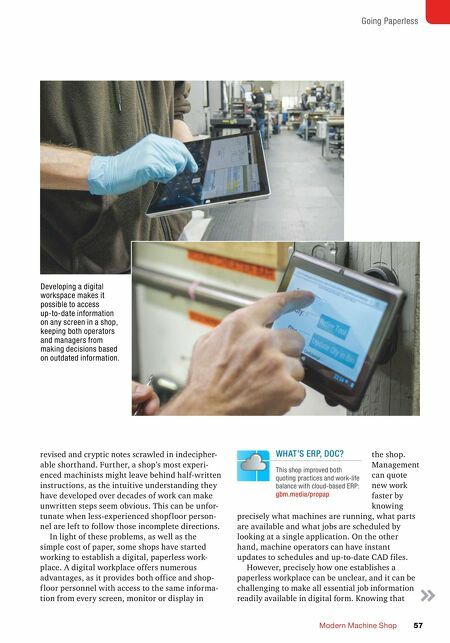 One of the most common features of a machine shop is a job traveler. One of the rarest finds in a machine shop is an up-to-date job traveler. This classic packet of paper docu- mentation that follows a work order through the various stages of design, machining and inspec- tion can be a mishmash of instructions, with clear and accurate documentation sometimes lost in the clutter of older part designs that have been ELI PLASKETT | ASSISTANT EDITOR Digital workstations provide access to up-to-date setup information that renders the paper traveler obsolete. Not only can digital travelers provide more accurate and more detailed setup information, but they do not run the risk of getting misplaced.